These easy to make Chipotle Mozzarella Sticks prove that big, bold flavors can come in bite-sized packages. They make a tasty, cheesy, and spicy appetizer. Thank you to Farm Rich for sponsoring this post & inspiring this recipe. All opinions are my own. 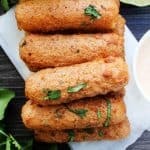 Inspired by my husband who loves anything with cheese and that’s spicy, these baked Chipotle Mozzarella Sticks are an amped up mozzarella stick. Baked in a chipotle sauce, these Farm Rich Mozzarella Sticks are perfect as a game day appetizer, fun after school snack or even as an easy meal. Made with chipotle peppers, lime juice and fresh cilantro, this chipotle sauce compliments the breaded cheese sticks. My kids love mozzarella sticks and could eat them every day. We prefer the Farm Rich brand as they are made with 100% real mozzarella cheese! Found at my local grocery store, their products are made for real life, offering tips/hacks, recipes, and great tasting food that helps simplify everyday life, and that’s exactly what A Dash of Sanity is about. While the kids could go for the Mozzarella Sticks straight from the box, my hubby and I love to mix things up. We are a saucy kind of people. So adding my chipotle sauce to these mozzarella sticks was an instant winner for us both. Not only are these completely tasty, but simple to make. 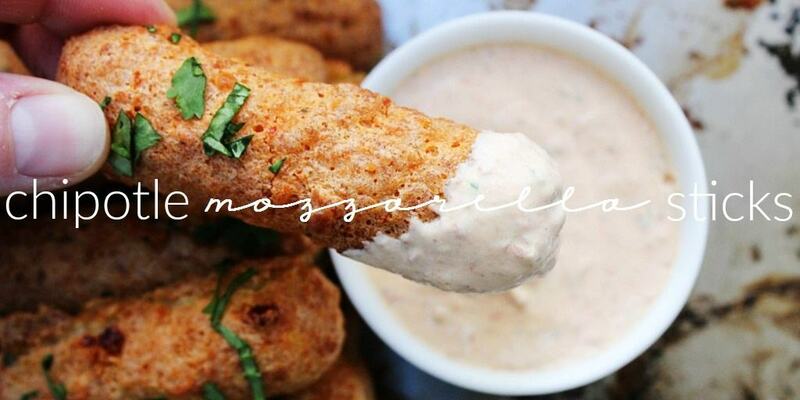 Step up your appetizer and snack game with these Chipotle Mozzarella Sticks. You’ll rack up another win with your cheese & spice lovers out there. How do you make Chipotle Mozzarella Sticks? Add crema, chipotle peppers, cilantro and lime juice from 1 lime into a blender and blend on high for 12-15 seconds. Set aside. In a large mixing bowl, add Farm Rich breaded Mozzarella Sticks; pour sauce over the Mozzarella Sticks and toss to coat. One at a time, place the mozzarella sticks coated in chipotle sauce on a baking sheet and place in preheated oven for 10 minutes. While Mozzarella Sticks are baking, make the Chipotle Dip. Add yogurt, sour cream, chipotle pepper and lime juice from the ½ of lime to a blender and mix until well combined (it only takes a few seconds). Spoon dip into a small bowl and set aside. After 10 minutes, reduce oven temperature to high broil and broil for 3-4 minutes until Mozzarella Sticks are a nice golden brown and crispy. Remove from oven and cool on pan for 2 minutes. Remove from pan using a metal spatula and serve with Chipotle Dip. Enjoy! To get tasty recipes like Chipotle Mozzarella Sticks, exclusive offers and promotions, sign up to be a member of the Farm Rich Club. Don’t forget to pin this recipe to your favorite Pinterest board to make for later. You know how to dress up some cheesesticks! This is going to be a bad addiction! I love all the extra flavor you added to these! Sign me up!